My earliest memory of confronting extinction was in primary school – growing up in Australia in the 1990s, a kid’s education show ‘Behind the News’ covered a story on cloning the Tasmanian tiger. Prominent in my mind is an image of a shrivelled pup floating in a jar with clinical writing scrawled across a label tied to its paw. We were told that DNA could be extracted from this specimen and used to re-animate the species. Over 20 years later, and despite official efforts to clone the tiger being scrapped in 2005, it seems we are still captivated by the idea of de-extinction. The publishing of the thylacine genome received a lot of media attention (rated in the top 5% of all research outputs scored by Altmetric) and along with it came a revival of the cloning story. However, if you take a look at the abstract in the thylacine genome paper published in Nature Ecology and Evolution, it does not mention the prospective cloning as an application of sequencing the genome. In fact, a lot of the information in the media coverage is conspicuously absent from the original publication. 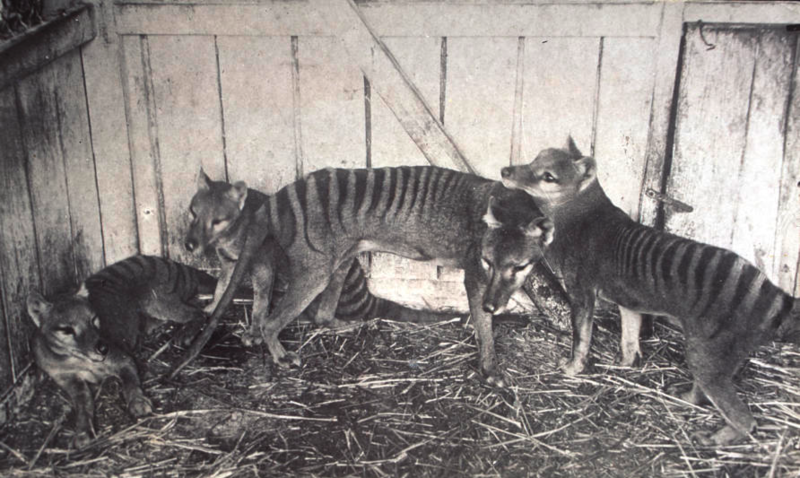 In addition to claims of the thylacine genome sequencing bringing us ‘one-step closer to cloning the tiger’, there have been more pernicious claims that the species’ was already ‘on the way out’ long before the colonial invasion of Australia. The science communication of the thylacine genome paper broke down in several ways and ultimately led to the dispersal of inaccurate and misleading information. To help clear up the SciComm mess around the reporting of the thylacine sequencing paper, I spoke to several scientists that work in ancient DNA, including an author on the paper, evolutionary biologist Dr Kieren Mitchell, and Dr Lauren White, a wildlife geneticist and expert in population genetics of Tassie tigers. Does sequencing the genome make it easier to clone the Tassie tiger? "The thylacine would be a terrible candidate for de-extinction, even if we had the know-how"
The problem with such zealous reporting on de-extinction is that 1) Tassie tigers are terrible candidates to clone, and 2) it could jeopardise existing conservation efforts and funding for living species. Cloning extinct species for the purpose of de-extinction is an area that has been criticised as pseudoscience and would swiftly lead us into a murky ethical bog, so it’s a topic beyond the scope of this blog post*. Ultimately, it’s a shame that the de-extinction angle of the media coverage appears to be at the expense of the other interesting, and biologically important, findings of the paper. Speaking of which, if the genome wasn’t sequenced to help clone Tassie tigers, why did scientists do it? The answer to that brings me to the next SciComm mistake. Why are Tassie tigers being compared to dogs? Media coverage has emphasized the finding that thylacines are not closely related to dogs, which is true, but by no means a surprise to any biologist. Tassie tigers are marsupial mammals, whereas a dog is a eutherian or placental mammal. Dividing mammals into these broad groupings is based on many biological traits, but a simple way to think about the difference is to compare their reproduction: marsupials give birth to ‘undeveloped young’ that usually spend time in a pouch, whereas eutherian mammals have longer gestation periods and no pouch. Scientists have known for a long time that marsupials and eutherians are only distantly related - they are estimated to have last shared a common ancestor over 160 million years ago, an age when mammals were fur balls at the feet of dinosaurs. So, what did the paper actually find? The first figure from the thylacine genome paper clearly invites comparison between the two, distantly related mammal groups, making it easy to see how journalists may have miss-understood the paper. The bulk of the genome paper set out to address this very question. Mitchell says “One possible solution to this apparent paradox is that closely related organisms may have more similar genomes on average than more distantly related organisms, but that small and important segments of the genome could be very similar between distantly related organisms”. They compared the genes inside the genome to see “if there were any genes that were more similar between the thylacine and wolf than expected, but didn't really find anything”, says Mitchell. They suggest it could instead be the ‘non-gene’ parts of the genome, which regulate when genes are switched on or off, that might be responsible for the convergent evolution. What the media should have emphasised was that the paper was comparing genes that were shared by both thylacines and dogs that may explain why they look so similar. However, just by skimming the abstract and main figures, it’s easy to see how a non-expert might misunderstand the nuance of the genomics evolution paradox. Furthermore, if you relied on the media release alone then you’d be in trouble too: “Secrets from beyond extinction: Tasmanian tiger was a kangaroo in wolf’s clothing”. Unfortunately, the title of the press release reflects the ambiguities within it. So, what’s the SciComm lesson to take away? Most SciComm is an interaction between scientists, communications team at the university or research institution, and journalists. Most journalists do not have specialised training in Science, thus it’s an essential job for scientists to work closely with their Comms team to accurately communicate the findings of their paper while also being vigilant of possible misinterpretations. To be fair, this is not a trivial task, but it does highlight a prominent issue facing SciComm today. This is by far the most dangerous idea to have been circulated as a result of the media coverage on the thylacine genome paper. Surprisingly, this misinformation probably began with a piece in The Conversation by Prof Andrew Pask who’s the last author on the thylacine genome paper. Although he concedes in the first sentence that there’s no doubt that humans killed off the Tassie tigers, the inflammatory headline contends otherwise. Please stop spreading alternative facts about the #Thylacine. We exterminated them when their population was doing well, to protect the farming industry in Tasmania. And de-extinction is still a myth! The second figure from the thylacine genome paper shows effective population size through time: showing a steady decline in Tassie tigers and devils over thousands of years. However, populations appear to have stabilised and even increased approx. 6,000 years ago. The main issue with this misinformation is that, based on the results of the paper, you cannot come to the conclusion that Tassie tigers were 1) at risk of extinction, or 2) more susceptible to diseases or other ill effects of having low genetic diversity. 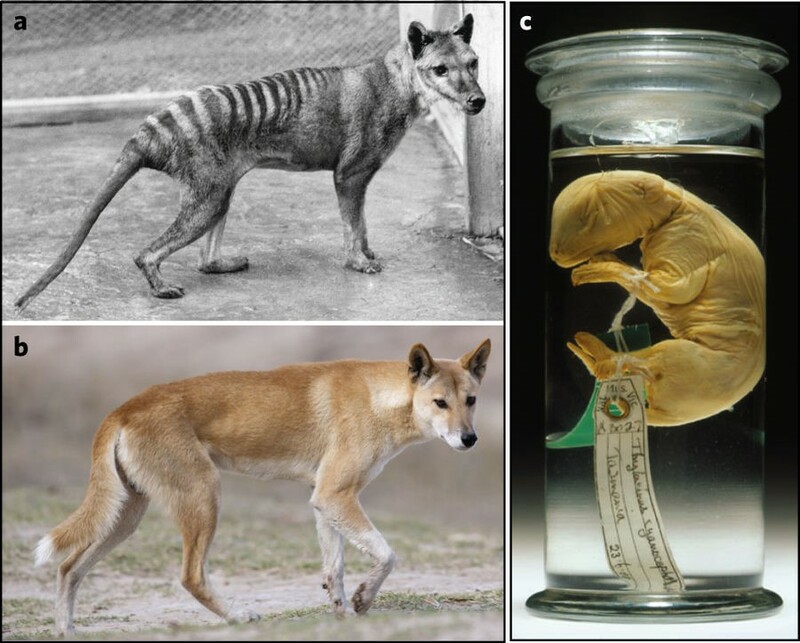 Despite some excellent coverage of the thylacine paper (e.g. Nature), the overwhelming focus was of de-extinction cloning. This diminished the opportunity to convey the fascinating main findings of the paper. As a scientist, I think there’s always a risk that your results will be misunderstood, but it is our role to effectively and accurately communicate them to a non-specialist Comms team or journalist. Hopefully, as scientists, journalists and general Science communicators, we can learn from the mistakes in the media coverage of the thylacine genome paper. What did you think of the media coverage on the paper? Could it have been handled better? Do scientists have to get better at SciComm? Or should there be greater emphasis on Science training for journalists? Interested in hearing your thoughts in the comments!